Card of the Day ~Ask For A Sign~ If you’re feeling stuck or confused, then you need a sign to point you in the best direction. Signs are some of the most interactive and consistent messages the angels can bring. When you regularly ask for them, you’re shown constant reminders that you’re on the right path, and receive clear guidance to help keep you there. As an Indigo, you may feel disconnected from other people and wonder why you can’t relate to them. 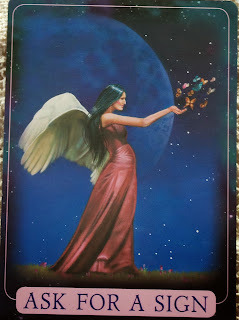 Ask the angels to show you a plain and recognizable sign that your wish/purpose/dream/hope/desire is relevant and possible, and to let you know the next step for you to take. You will be very pleased with the outcome, as Heaven will validate and guide you clearly. All you have to do is ask! Be sure to keep your mind open to all possible signs that you are on the right track. I pray you have a fantastic day. I love you all! P.S. Thank you for being patient with me as I laid my father to rest in Heaven.